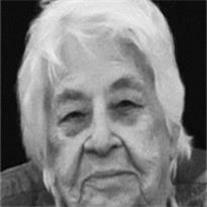 Hipps, F. Dolores, passed on Nov. 19, 2012 at the age of 91. She was born Oct. 26, 1921 in Belmont, NE and has resided in AZ since 1950. She is survived by 8 children: Jeff and Lola Krummenacher, Steve and Glenna Krummenacher, Bill and Yupa Hipps, Bob and Kristine Hipps, Joan and Garry Boyle, Jean Hipps Buonforte, Jim and Holly Hipps, John and Cindy Hipps, 47 grandchildren and 101 great-grandchildren who all remember her as gentle, powerfully patient and fiercely proud of all of them. We will miss her childlike delight with life, her graciousness to others and her sparkly eyes. She was never tied to the material things of this world, for her confidence was in the Lord. Services will be held Saturday Nov. 24: Viewing 9:15 to 9:45 a.m.; Service 10:00 – 11:15 a.m., at The Church of Jesus Christ of Latter-day Saints, 21320 S. Greenfield Rd., Gilbert, AZ.